Apparently the speed of light in our universe isn't quite as constant as science first thought. 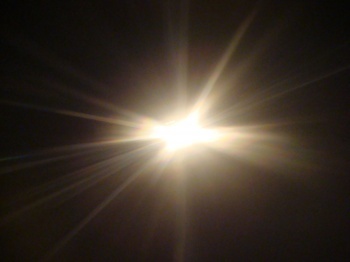 The speed of light is considered one of the rare absolutes of the entire universe. When we're not calling light the fastest thing in the universe, we're using it to measure the distance between stars. What's more, light never slows down - even when it goes through something like a glass of water, the speed change is temporary and barely perceptible, returning to normal when it exits the other side. At least that's what we thought, until scientists found a way to slow light the rate of light's movement altogether. The experiments behind this discovery were conducted in Glasgow university, where researchers constructed what basically amounts to a photon racetrack. This allowed the team to runs pairs of photons along the track while exposing one photon to a mask to change its speed. Normally, both photons should reach the end of the meter long track at the same time. But when using the mask one photon arrived at a close second, only by a few millionths of a meter, but still enough to tell that the speed had been reduced. According to Glasgow professor Miles Padgett the crucial component is the mask itself, a software liquid crystal that looks like a bullseye target. "That mask patterns the light beam, and we show that it's the patterning of the light beam that slows it down," he explained. "But once that pattern has been imposed - even now the light is no longer in the mask, it's just propagating in free space - the speed is still slow." There's a lot of super complicated quantum waveform data explaining what's happening here, and you can read the full study if you prefer the technical explanation. But it has some pretty big implications when considered fully - if something were to affect the light of distant stars to slow it down, then it means our measurements of the universe's size could be full of holes that need to be adjusted. We're probably okay when it comes to, say, the distance between the Earth and the Moon, but other short distances may need to be double-checked for slow-moving light photons, or taken into account so we don't misstep when traveling the stars. I wonder if this is an example of energy of James Clerk Maxwell's energy of information. But as more general case is doesn't really effect astronomical data. I can't think of single large astronomic phenomena of which light is capable of passing throw and capable of the high speed oscillations that the mask requires. Also gravitational lensing would easily show up slow photons by now. One image would have a different redshift to the other. It doesn't "slow" the photon, it just delays it. It still travels at light speed, just not all in one go. Interesting. Now, someone can feel free to correct me on this as I am not as familiar with this as I am with other things: I distinctly remember reading a Scientific American article, circa 1998, that basically pointed out that we use light speed as a constant measurement but it's not constant. It's speed is adjusted all the time by gravity and it bends light (which all gravity does, even really weak forces of it). It stated that light often times does not travel at it's optimum speed. I have just always assumed that this was adjusted for with a reasonable margin of error when it comes to measuring distances between stars and galaxies. Doesn't that make it sound like the light has actually been slowed? It doesn't sound like he just means "While it's going through our medium". I mean, if he meant the latter, it wouldn't exactly be "Stop the presses! ", in terms of news. This paper talks about single photons travelling in free space. This isn't the well understood phenomenon of light being slowed down by a medium. Sadly I can only read the abstract but I'm not sure I'd understand the paper fully anyway, I've forgotten far too much physics. This makes me sad. There's a lot of super complicated quantum waveform data explaining what's happening here, and you can read the full study if you prefer the technical explanation. But it has some pretty big implications when considered fully - if something were to effect the light of distant stars to slow it down, then it means our measurements of the universe's size could be full of holes that need to be adjusted. We're probably okay when it comes to, say, the distance between the Earth and the Moon, but other short distances may need to be double-checked for slow-moving light photons, or taken into account so we don't misstep when traveling the stars. Our work highlights that, even in free space, the invariance of the speed of light only applies to plane waves. Collimated light is sometimes said to be focused at infinity. Thus as the distance from a point source increases, the spherical wavefronts become flatter and closer to plane waves, which are perfectly collimated.
. It doesn't quote a scientist saying this though so I don't know whether this is the case or whether it's the reporter's spin. Given the state of science reporting I wouldn't count against it being the latter. I think that speed of light is somewhat of a misnomer anyway. It's a more fundamental property of the universe than that, photons just happen to have the properties to travel at that speed (they're free and massless). It's only really called the speed of light for historic reasons. it has some pretty big implications when considered fully - if something were to effect the light of distant stars to slow it down, then it means our measurements of the universe's size could be full of holes that need to be adjusted. You mean affect. Honestly, I can't understand how people can mix that up! Anyway, this is certainly an interesting discovery if I understand it correctly. Hang on, I thought that refraction basically relied on this to work. Sure I don't think it would be as effective, but the whole reason the light waves bend is because the glass causes one side to slow down causing a change in direction. The key point is that the light stayed slow after leaving the medium. It's not very well explained in the article, but this is a different phenomenon to light slowing down in a medium which is what causes refraction. Um, this is quite rediculous if you ask me. I was a physics student once. I failed, but that doesn't mean I didn't pick up anything. Besides which, I still have the textbooks. Saying light never slows down is complete BS. What remains constant, is the speed of light in a vacuum Which is, very roughly 300,000 km/s. However, it's speed in other media is quite a bit lower. Since this is actual research I'm sure it must have some actual significance, but the way this article describes it is absurd. Anyway, you know what the 'speed of light in glass' is? Because it's in the region of 200,000 km per second. Then there's cherenkov radiation, which offscreen sources describe as the reason the warp core glows blue in Star Trek, but which is a real effect witnessed with the fuel rods in nuclear reactors. The characteristic blue glow produced by this cherenkov radiation is caused by particles exceeding the local speed of light! This obviously would't be possible if the speed of light were a constant under all conditions, but it's quite possible in, say, water. in water that means you have the gap between 225,000 km/sec and 300,000 km/sec in which objects can in fact exceed the local speed of light. And anything which does so will create a blue glow. Which is called cherenkov radiation. In any event this article, (whatever the truth of the research it is reporting) is very badly written, to say the least. I love how I always learn more from the comments section than I do from the actual article. Also, now I want to pass light through a Bose-Einstein condensate. It sounds like it would look really cool. "NOTHING is impossible! It all came to me in a dream..."
... How is this news? These findings were available 50 years ago and have been used as criticism for Einstein's theories. This article does a very bad job at describing it, but it looks like they've found that light can slow down in free space. This is completely new, and not the same as light slowing down in water or glass, which has been known for 50 years. If true, it means that everything we know about distance in space could be wrong. Wait, you mean creationists may be right after all? I don't want to live in such world. This article reminded me of an old sci-fi novel by Bob Shaw called "Light of Other Days", where someone invented a glass pane that could hold several years worth of light - as if it was several lightyears thick, from the point of view of a photon inside it. Pretty sure it means that Pastafarianism is correct...mmmmmm, pasta! Please say "Theory suggests" & "may be able to" in future. Meh! I did that yesterday. I just turned out the lights and it's speed dropped exponentially. as others pointed out, speed of light is not constant, its dependant on medium its traveling through. that being said if the light stayed slower after it has left a medium and this is not yet another miscalculation (like the one where they broke the speed of light that turned out to be a miscalculation) this looks pretty damn interesting. I think this will need to be confirmed a few times over and what specifically they did to the light to slow it down. Findings out of bounds like these usually turn out as measurement or math error, none the less could be some incredibly interesting stuff is confirmed.